Mr. Panucci was the owner of Panucci's Pizza, a small pizza parlour in downtown Old New York City. He was Fry's employer since at least August 1997, and his shop served as home for Fry's dog, Seymour and later his time paradox duplicate until an explosion in 2012 destroyed the parlour. Mr. Panucci stayed faithful to his shop for many years, and saw after Seymour after his owner's disappearance. It is possible that he abandoned his shop some time before the destruction, but due to the presence of a regular customer amongst the fossils, this is unlikely. Mr. Panucci was a tough employer, but not unkind in his way. He always liked having Seymour around in the kitchen, even if it meant stretching health standards a little, and was friendly enough with Fry for the most time. He also allowed Fry to live in the upstairs storage room after Michelle kicked Fry out. He is presumed to have died at some point after 2012. His surname suggests that he is of Italian descent, but he does not speak with an Italian accent. It can be assumed that he is not a first generation Italian-American. 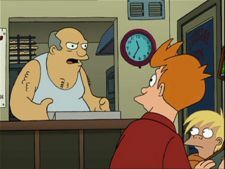 Mr. Panucci: Hey, Fry! Pizza going out! COME ON!! Mr. Panucci: There's only three real monsters, kid: Dracula, Blacula, and Son of Kong. Now quit picking your nose and knead that dough! Fry: Oh, hey, Mr. Panucci, I'm back from that delivery to the cryogenics lab. Mr. Panucci: Great, I'll put you on the cover of Big Whoop Magazine! Fry-2: Oh, hey, Mr. Panucci, I'm back from that delivery to the cryogenics lab. Mr. Panucci: I know. I read about it in Big Whoop Magazine! This page was last edited on 15 February 2016, at 21:24.